Although analysts at Conning didn’t actually use the word “shocked” in their latest report on the property/casualty industry’s loss reserve position, the title of the report—and the image on the front page—made it clear that the analysts didn’t see the answer they got coming. 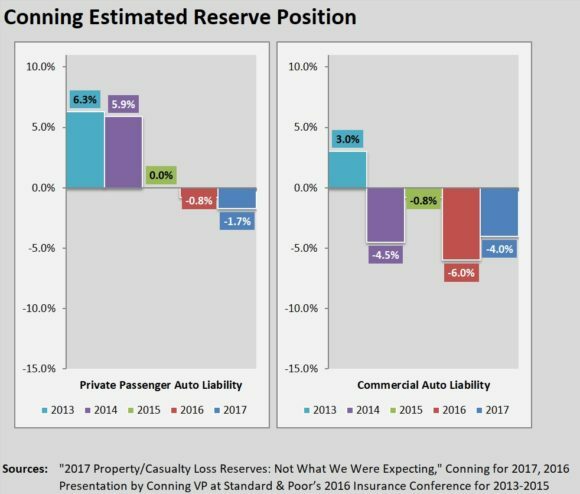 The answer: Conning now estimates a 2.6 percent redundancy for reserves carried at year-end 2017. That’s up from the prior year’s study in which Conning estimated a 1.2 percent redundancy for reserves carried at year-end 2016. “The property/casualty insurance industry’s reserve position improved slightly in 2017,” said Bill Burns, Vice President, Insurance Research at Conning, in a statement about the report titled, “2017 Property/Casualty Loss Reserves: Not What We Were Expecting,” which displays a strawberry sliced open to show the inside of a kiwi on its cover. “The industry continues to carry sufficient reserves, assuming claims settlement patterns continue at the current pace,” Burns said. That’s a figure that caused analysts at Standard & Poor’s Global Ratings to do a double-take too. During a webinar last month, S&P analysts displayed a graph showing the nearly $13 billion takedown of prior-year reserves in 2017, next to a $3 billion takedown in 2016 and a $7 billion takedown in 2015. The $13 billion “really outpaces the prior years,” observed Tracy Dolin-Benguigui, a director for S&P Global Ratings. “In prior years, you may have had the AIG factor that overshadowed [things] a bit. “But overall, we really expected this trend to moderate in the coming years. So, it did catch us by surprise,” she said. Benguigui was referring to the fact the American International Group experienced significant adverse development in several commercial lines in 2016, something that Conning’s report mentions as well— and adjusts for the analysis of the year-end 2017 reserve position. In this year’s data, AIG’s impact on loss development patterns was significant for the other liability segment, so Conning provides results including and excluding AIG for that line of business. 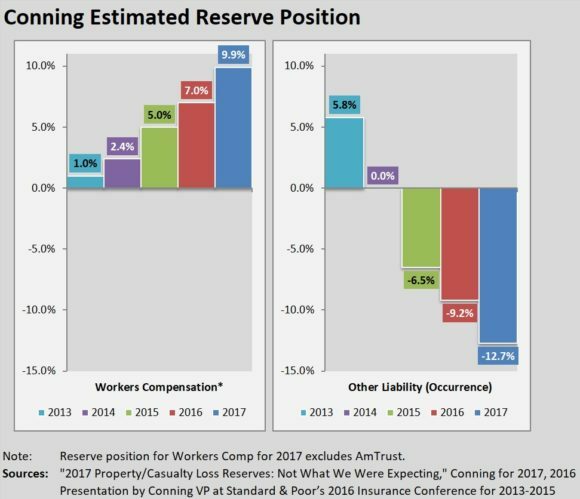 Conning also makes adjustments for distortions related to AmTrust, a top 10 writer of workers comp, which entered into a significant loss reserve development reinsurance agreement last year, causing negative loss development to show up for that line on AmTrust’s 2017 Schedule P. (Conning’s loss reserve studies are based on an extensive analysis of Schedule P of the annual statement using data provided by A.M. Best). Conning completely excluded AmTrust’s data from the workers comp analysis, and presents results including and excluding AmTrust for other liability in the report. In spite the favorable position of the industry overall, Conning found the other liability lines (claims made and occurrence) to be deficient. While Conning estimated that a redundancy for the workers compensation line grew larger—to 9.9 percent of carried reserves, or $14.0 billion, for the industry excluding AmTrust, a deficiency for the personal auto line worsened, Conning estimated. Conning also provides estimates of reserve positions for homeowners, commercial multiperil, commercial auto, medical professional liability and some short-tailed miscellaneous lines. Together, the lines reviewed represent 90 percent of total reserves and 96 percent of premiums for the P/C insurance industry. For each of the lines, Conning provides a point estimate and a range around that estimate. Overall, for all lines combined the range extends from a 1.0 percent redundancy to a 4.3 percent redundancy. 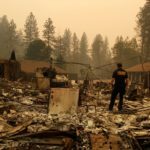 The report also includes a separate analysis of loss reserves for mid-sized insurers, defined by Conning as those with annual premiums between $100 million and $2 billion. These companies outperformed the industry, with reserves that were 5.2 percent redundant at year-end 2017 by Conning’s estimates, the report notes. 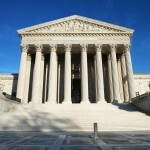 Sclafane is executive editor of Carrier Management, where this article was originally published.